Graduate students from a wide range of disciplines are helping an editor-in-chief duo reestablish the African Studies journal. Ufahamu, which means understanding in Swahili, is run exclusively by UCLA graduate students. Established in 1970 by the university’s African Activist Association, it is an internationally acclaimed interdisciplinary journal on African Studies. In fact, it is one of the oldest such journals in North America. Among its founding members were Sondra Hale, UCLA professor emerita of anthropology and women’s studies. The student-run journal seeks to address misconceptions about Africa by publishing a wide array of multidisciplinary research, ranging in topic from African history, literature, politics, law and economics to issues of sociology, anthropology, urban planning and development. Over the past 45 years, Ufahamu has also featured articles by top Africanist scholars, including Ali Mazrui, Walter Rodney, Mahmood Mamdani, Ned Alpers, Chris Ehret, Bobby Hill, Robin Kelley and Bill Worger. Historically, students in the African Studies MA Program of the UCLA International Institute have played an active role in running the journal. “Two of our second-year students currently serve as editorial staff members, and recently participated in the successful launch of Ufahamu as an e-journal,” explains program chair Lydon. The editors-in-chief of the journal for the 2014–15 academic year are Nana Osei-Opare, a PhD student in history, and Jeremy Peretz, a PhD student in World Arts and Cultures/Dance. Over the past year, both have worked tirelessly with students and staff members to restore its 45-year legacy. “The current editorial team. . . helped restore confidence to authors and the wider African Studies community in the world that Ufahamu is indeed alive and kicking,” says Osei-Opare. “My goal. . . [is] to promote African scholarship from the continent and from peoples of African descent who are denied venues to highlight their work in dominant academic spaces,” he adds. The journal's 2014–15 senior editors are Erica Anjum and Emily Milstein, both pursuing MA degrees in African Studies. Anjum and Milstein work with a team of committed graduate student editors, including Wajenda Chambeshi (MA, Public Policy and African Studies), Natalie Dickson (MA/MPH, African Studies and Community Health Sciences), Amanda Domingues (MA, African Studies), Janice Levi (PhD, History), Elaine Sullivan (PhD, World Arts and Cultures/Dance) and Amber Withers (PhD, History). Sanyu R.K. Mulira, a lecturer in the Ethnic Studies department at California State University, Sacramento and graduate of UCLA's African Studies MA program, is also a contributing editor. ​The journal's revival is also due in part to the support of a number of other people on campus. That list includes Stacey Meeker, director of publications at the UCLA Graduate Students Association; Ufahamu’s layout editor, Bill Morosi, and copy editors Nancy L. Sayre and Michelle Gaston; and Sheila Breeding and Claire Pfitzinger of the UCLA African Studies Center. “[They] have put in very long and grueling hours in helping Ufahamu get back to where it needs to be,” remarks Osei-Opare. Their work has paid off, as the journal has met with marked success. “We have received a lot of good will from older editors and professors across the United States and Africa,” says Osei-Opare. Milstein, who joined Ufahamu last year as a senior editor, has taken on the task of reviewing journal submissions, working with authors to prepare their articles for publication. “I also help prepare our editions for publication by doing things like citation checks and typing and copy editing articles,” notes the graduate student. “[And] I work on outreach to expand our readership.” Milstein’s own research examines the Hawala financial mechanisms that Somalis use to transfer remittances over long distances. Another member of the editorial board, Domingues, works with authors to review their manuscripts in light of reviewer comments. “The opportunity to work with Ufahamu . . . keeps me engaged with many areas of research related to Africa,” she remarks. Anjum, a fellow African Studies MA student and senior editor, agrees. “I feel fortunate to work with an organization and a journal that have such great legacies.” she explains. “It's been wonderful to meet and work with other Africanist scholars and activists — locally and globally.” The graduate student is also a co-director of the UCLA African Activist Association, for which she is organizing an upcoming celebration of African Liberation Day. Osei-Opare agrees with Anjum, noting, “It is also Ufahamu’s goal and mandate to push the envelope and be an activist journal.” In fact, the publication is currently engaged in the #RhodesMustFall and #BlackLivesMatter movements. 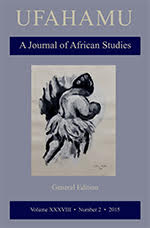 ​African Studies graduate students also regularly contribute articles to Ufahamu. The most recent issue (volume 38, no. 2), for example, featured book reviews by Milstein and fellow African Studies graduate student, Sigin Ojulu. Milstein reviewed Nigerian novelist Chinua Achebe’s book, There was a Country (Penguin Press, 2012), which she described as “part memoir, part historical narrative and part collection of poems.” Achebe’s book traces the secession of Biafra, Nigeria, in 1967 and the civil war that followed. 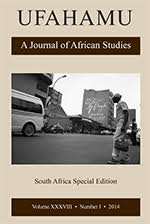 Milstein also published an article (“Nation-Building through Film in Post-Apartheid South Africa”) in the journal’s fall 2014 issue (volume 38, no. 1), for which she also wrote a review of an exhibition at the UCLA Fowler Museum. Ojulu reviewed Jemima Pierre’s book, The Predicament of Blackness: Postcolonial Ghana and the Politics of Race (University of Chicago, 2013) on racialization in contemporary Africa for the most recent edition (volume 38, no. 2). 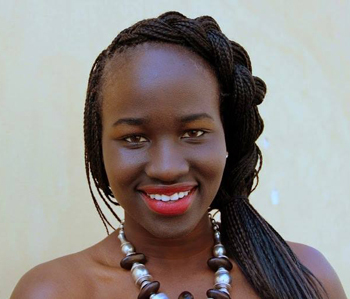 Ojulu’s own research focuses on nationalism and nation-state building in South Sudan. “I’m interested in how global processes of racialization and ethnicization have shaped this region and what prospects there are for a mobile state in the face of historical trauma,” notes Ojulu, who has served as a Citizen Ambassador to the United Nations since 2011. The final issue of the academic year will be published in on May 29. It will feature articles from the journal’s archive that proved influential in African Studies, reinterpreted in a contemporary context. This article was first published on May 7, 2015 and updated on May 15, 2015.